What's 88 years old but still incredibly shiny? The Geneva Motor Show of course. One of the longest-running industry shows in the calendar, it has consistently featured the best and brightest new models, innovations and prototypes in the auto industry, and is traditionally where some of the most creative stand designs come to life. So it made sense for us to send two of our roving designers, Jon and Emilia, to take a look, get inspired, and give us all a rundown on the best of what they saw. 1. 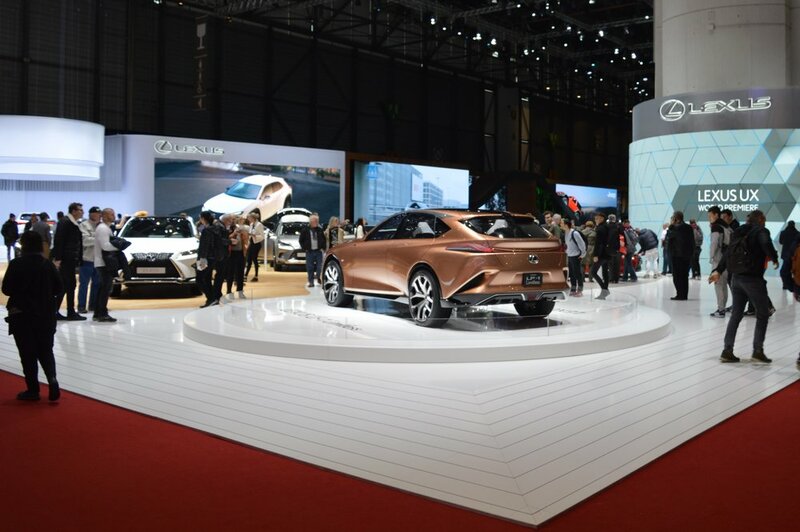 Natural materials from Lexus – With the sort of restrained elegance and luxury feel you’d expect from such an upmarket brand, the Lexus stand was a beautiful combination of natural wood and a minimal colour palette. Showcasing their design journey was a great way of illustrating their brand values. 2. Nissan’s creative stand design – good stand design always considers the context rather than just the stand in isolation, and Nissan’s stand cleverly echoed the angle of the venue’s escalators with sections of race track to display its models to best advantage. 3. Bringing the brand to life by Peugeot – In a gloriously self-indulgent use of stand space, Peugeot brought their iconic lion into three dimensional reality with a huge sculpture. While it isn’t a car, it attracted crowds of people keen to take photos and selfies – and post them on social media, creating considerable show buzz. 4. BMW’s masterful model launch – One of the key launches of the show was the BMW M8 Gran Coupe concept car, and they pulled out all the stops, with a revolving marble floor, synced music and lighting and dry ice. A masterful touch however was the use of mirrors – not only did these allow the crowds to see the car from all angles, it ensured that most photographs couldn’t fail to show just how well-attended the stand was. Well played, BMW. 5. Jaguar Land Rover’s use of Virtual Reality – As you’d expect from such a key player, the Jaguar Land Rover stand was very impressive, with some beautiful interactive panels combined to provide 3D displays. Their virtual reality area really stood out, using futuristic lighting and minimal design to set it apart from the rest of the stand area and providing a really exciting way to interact with their products.